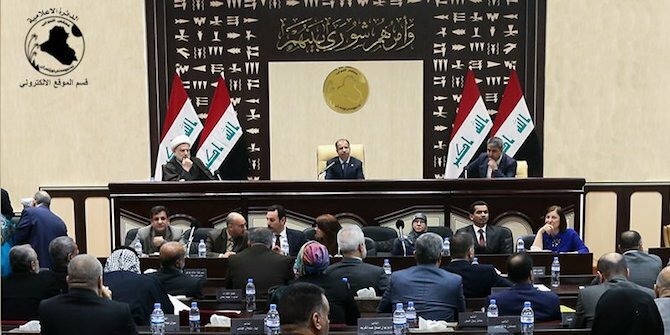 The Iraqi Constitution: A Red Herring for Politicians’ Failure? In October 2005, two and half years after the collapse of the Saddam Hussein regime, Iraq held a referendum on a new constitution. The constitution was ratified after 78.5 percent of the country voted in favour, while the three Sunni governorates of Mosul, Tikrit and Al Anbar voted to reject it. With a new constitution in place, Iraq entered a new political era. A permanent Council of Representatives (the Iraqi Parliament) was elected in December 2005. A series of parliamentary and provincial elections have followed suit. Shortly after ratification, though with the exception of most of the Kurdish politicians, there began a trend of Iraqi politicians adopting an antagonistic position towards the constitution. Many politicians who had supported the ‘yes’ vote demanded constitutional reform not long after the referendum. Some justified their position through reference to Article 142, which stated that a committee was to be formed by the Council of Representatives with the aim of introducing recommendations for the necessary amendments to the constitution. Article 142, however, included a condition requiring a public referendum on the amendments which could be vetoed by two-thirds of voters in any three or more governorates. The Kurds, who played an important role in drafting the constitution, looked on sceptically at the Iraqi politicians agitating for reform. The Kurds’ view was driven by their historical lack of trust in Baghdad and by the fact that many of the constitution’s articles included short and long-term possible remedies to the chronic Kurdish question. The antagonistic rhetoric towards the constitution adopted by Iraqi politicians, intellectuals and influential non-state actors was focused on its contents and the circumstances under which it was drafted; the constitution being ultimately framed as an obstacle to the country’s progress. This rhetoric became an excuse for Iraqi politicians to suspend their efforts particularly in areas such as tackling endemic corruption, strengthening security and improving services. Iraq was ranked 153/178 in 2014, 170/175 in 2016 and 169/180 in the 2017 perception corruptions index. Sectarianism played an important role in reinforcing this antagonistic position. Politicians from each community denied responsibility for the failure of achieving development and instead blamed this failure on the constitution. It is still characterised by politicians as being non-applicable and blurry in many of its Articles, promoting a weak, consensual government since ‘the system of government is republican, representative and parliamentary’ rather than presidential, as stated in Article 1. Such arguments can be easily contested by the fact that since the first elected parliament, several executive Articles and laws are still pending legislation and/or implementation. Some are as simple as the law of the flag and national anthem (Article 12), while others are highly controversial such as Article 140, dedicated to finally resolving and settling major issues related to the Kurdish question. An overview of the Iraqi constitution could lead one to the conclusion that it was designed, to some extent, to maintain power-sharing among different factions within Iraq. The overlapping between executive authorities, a confusing system which is nevertheless the prerogative of federal authorities, is an example of this. Articles 46 and 66, for example, make it difficult to reach consensus in the parliament, where different parties and factions complicate the decision-making process. In addition, the constitution gives a lower profile to the head of the ministerial council, the so-called prime minister, than in the Westminster system. This was/is the main excuse offered by different prime ministers to justify their failure and inability to move the country forward since 2005. Excuses based on the existence of overlaps in executive power, or the limits attached to it, cannot justify years of repeated failure. Successive governments failed to secure and maintain basic infrastructure such as providing electricity, potable water, schools, hospitals and transportation, despite spending a budget of close to one trillion (US) dollars over a 14-year period. Iraqis rely mainly on the remains of the crumbling and neglected infrastructure from the Saddam Hussein era. Such statements and positions, of which there are numerous examples, are repeatedly stated by parliamentarians despite their oath of loyalty to the constitution. They then, very selectively, point to certain parts of the constitution (for instance, its apparent self-contradiction regarding disputed territories and regional self-government) to justify their position. In other words, they use the constitution for their own gain. For example, they will emphasise Article 110 which gives the federal government exclusive authority in certain matters such as the formulation and implementation of foreign and security policies. At the same time, they undermine Article 111, which allows for the exploration and production of oil and gas resources by local and regional governments. The predominantly Shiite government’s justification for its failure to act on this is that Article 111 is imprecise. Consequently, they block any attempts to legislate oil and gas laws, leading to conflicts arising with the Kurdish Regional Government on this matter. Most importantly, with or without adherence to the constitution, Iraqi politicians – primarily from Arab parties – continue to blame their failure on the constitution through which they gained their positions and privileges. Their constant demands for constitutional reform, from the current parliamentary status to presidential, are a manifestation of tribal and sectarian tendencies that promote authoritarianism and the exclusion of others. There is no question that after decades of brutal dictatorship, Iraqis still have a long way to go towards having a sustainable democracy. Meanwhile, it may be difficult to assess whether it is really the constitution or other factors that take precedence in shaping the political reality in today’s Iraq. However, Iraqi politicians will continue to play their opportunistic games, one of which is to blame their failure on the constitution. Faies Jafar is a senior Instructor at the University of Trinidad and Tobago and a Ph.D candidate at the Institute of International Relations at the University of the West Indies, Trinidad. His areas of interests are International Relations theory, the behaviour of small states, political psychology, foreign policy analysis and Middle East politics.